We’re no longer posting on this blog, but you can follow us on Facebook! conservationists need to focus on the less charismatic shark species. A tragic loss for the ornamental fish industry. Last Thursday many of us lost a great friend and the ornamental fish industry lost a tireless advocate. OFI Secretary-General, Alex Ploeg, his wife, Edith, and their son, Robert, were on the Malaysian Airlines flight 17 shot down over the Ukraine. A truly senseless tragedy. Practical Fish Keeping just published a short article about this tragedy and the impact Alex has had on the industry during his tenure as OFI Secretary-General. You may also go to the OFI website to read some personal messages from fiends in the global ornamental fish community. Our thoughts and prayers are with their two daughters , Mirjam and Sandra, who must now move ahead without their parents and brother. Dr. Tim and the AAHP. With Alex and Edith (second and third from the right) in Malaysia in 2011. 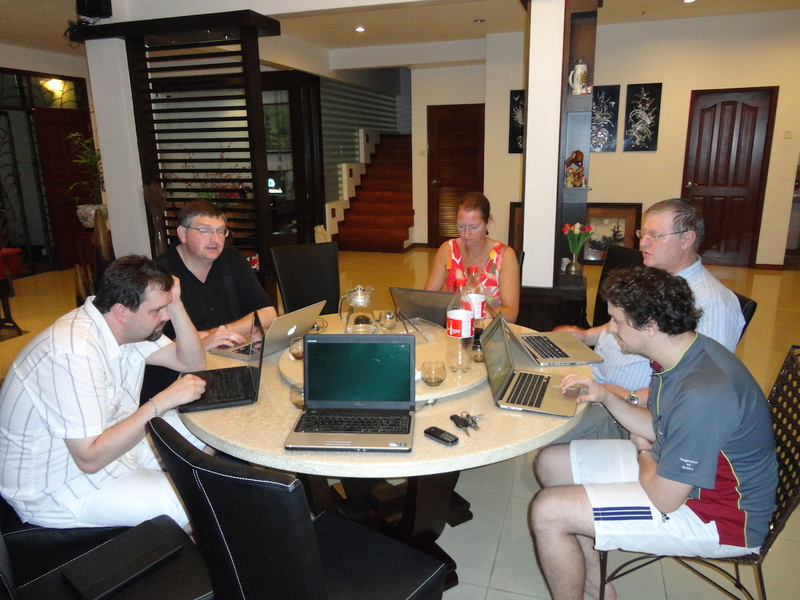 At the home of Raymond Cheah (Greeny Aquaculture), checking emails after a day of fish collecting. I have some fond memories of that trip with Alex and Edith. Aquarists of all levels of accomplishment tend to share a lot of the same attributes. They are intensely curious about aquatic animals, quick to lend a hand when a friend or colleague needs assistance, generous with their time, resources and expertise, passionate about providing the best possible care for their animals and keenly interested in fostering a sense of community with others in the hobby or profession. All these attributes and more were exemplified by many of the members of the Pacific Northwest Marine Aquarium Society when they heard that the aquarists at Hatfield Marine Science Center were planning to build a new coral reef exhibit in the Visitor’s Center. When members of the HMSC animal husbandry team recently rekindled their association with the PNWMAS and requested donations of coral fragments to give the exhibit a running start, many PNWMAS members graciously donated a wide range of different coral species. Several members collected and held these frags until HMSC Senior Aquarist Colleen Newberg and Staff Aquarist Kristen Simmons could pick them up and transport them back to Hatfield. Not only were PNWMAS members generous in the number of coral species they donated, they were generous in the quality of the animals as well. Many of the frags were of especially prized species that fetch a very respectable price at retailers. While it may be unseemly to quantify the value of animals in monetary terms, it would be much more so not to mention the value of this organization’s contributions to HMSC. PNWMAS members donated coral frags worth at least $3,000 and perhaps as much as $4,000 so that guests in the Visitor’s Center could enjoy the beauty and endless variety of forms of these animals. There’s another and much more important facet to this organization’s generosity. By fragging out corals and sharing them with other aquarists, the members of PNWMAS and similar organizations reduce collection pressure on natural reefs all over the world. No other type of habitat supports as much biodiversity as a coral reef and the majority of aquarists responsibly seek out animals that have been sustainably cultured in order to preserve these important resources. By sharing corals and other types of animals they have cultured, aquarists like these PNWMAS members become stewards of the animals in coral reefs everywhere, as well as the reefs in their homes. Hatfield Marine Science Center will be hosting the next PNWMAS meeting on Saturday, June 29. The members of the animal husbandry team are looking forward to meeting PNWMAS members and express their appreciation for the donations. They also look forward to returning members’ generosity when Hatfield’s coral propagation ramps up in the months ahead. Aleksandr Solzhenitsyn once said, “Talent is always conscious of its own abundance, and does not object to sharing.” The aquarists of the Pacific Northwest Marine Aquarium Society are a talented bunch, indeed. Thanks, folks, from the animal husbandry team at Hatfield Marine Science Center.